I always watch an episode at least twice before writing about it, and I’m very glad I did in this case. “The Education of a Magician” is definitely a piece of work that improves upon better acquaintance. On first viewing, I was disappointed at some of the liberties taken from the source material, but the second time around I was impressed with how well the adaptation is bringing to life the spirit of the novel, if not every single detail that I want to see on screen. 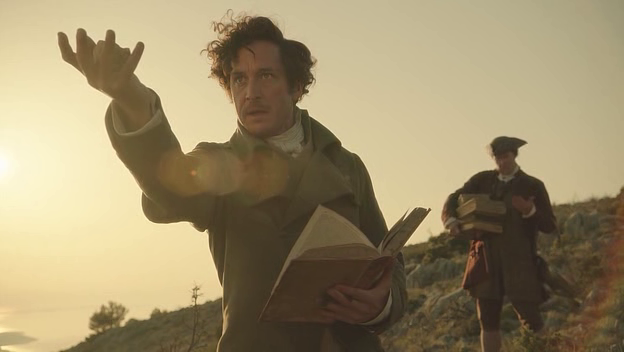 This episode contains, essentially, three stories: Jonathan Strange’s experiences in the Peninsular War, Mr. Norrell and how he deals with his pupil’s absence, and the advancement of Arabella Strange and Lady Pole’s friendship. We also start to see the increasing entwinement of the fates of Stephen, Arabella, and Lady Pole as well as the beginning of a huge gulf forming between Strange and Norrell as both of them cross some lines that they probably ought not (even though, at the end of this episode they seem as close as ever). 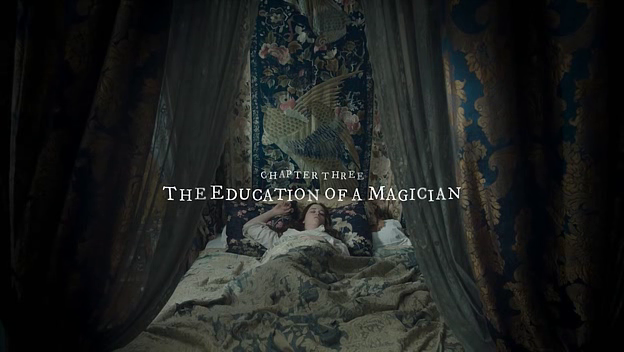 Interestingly, “The Education of a Magician” doesn’t open with Jonathan Strange, even though that might seem like the most exciting place to begin. Instead, the episode starts with Lady Pole waking up and having a new idea for how to tell Arabella about her predicament. She gets out of bed quickly and starts ripping up her dress to make a tapestry. Lady Pole’s tapestry is a somewhat interesting departure from the book, as it continues the show’s trend of expanding Lady Pole’s role and granting her somewhat more agency than she had in the novel. It’s nice to see, because I think Lady Pole is a tricky character who could easily have been flattened into a handful of unpleasant tropes or made into a simple damsel in distress. Instead, this adaptation actually improves upon the source material, giving us a Lady Pole who is clever and resourceful and never gives up trying to take back control of her life. As Lady Pole is working out new ways of communicating, Childermass is, at Norrell’s instruction, intercepting letters to prevent Arabella from telling her husband anything that Norrell might disapprove of. Also sandwiched in here is a pretty much straight-from-the-book conversation between Arabella and Drawlight that I was happy to see included. In Portugal, Jonathan Strange gets off to a rocky start with his military career, and Lord Wellington is downright dismissive of him. It seems to the two magicians have so far done more harm than good for the war effort, and Strange can’t provide what Wellington wants–men and arms–and is therefore useless. Strange is left quite at loose ends, with no magic to do and struggling to find a way to make himself useful in the war effort. Honeyfoot and Segundus at Starecross. Meanwhile, back in England, Childermass is also busy making sure that no one in England besides Norrell does anything resembling magic. 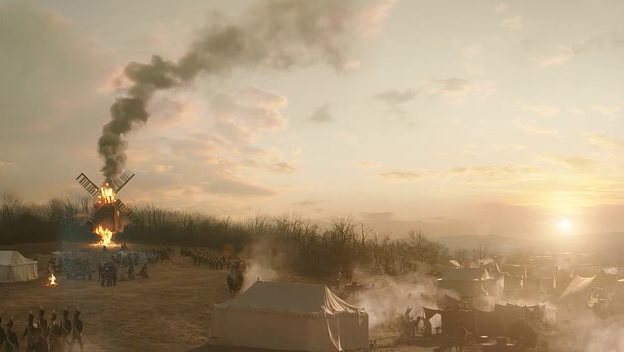 He rides out to Starecross, which Segundus and Honeyfoot are turning into a school for magicians and advises them to stop this plan before Norrell finds out. In exchange for their going into another sort of business, Childermass offers to send clients their way when he gets the chance. In London, Arabella continues her visits with Lady Pole, who is continuing to work on a tapestry illustrating Lost Hope. She shows the tapestry to Arabella, who doesn’t understand at all, which I found a little frustrating to watch, if I’m honest. For one thing, it’s not entirely clear quite how Lady Pole is not only able to make this tapestry but also to talk rather at length about it to Arabella. And in light of how much Lady Pole is able to say in this manner about her and Stephen’s enchantment, I’m honestly just not sure how Arabella manages to not see what her friend is getting at. I’m also not sure why Arabella doesn’t recognize the Gentleman in the tapestry, since he’s been creeping on her for a good while now. For all that I’m not entirely happy with the way this is playing out, this visit with Lady Pole has one of my favorite speeches in the show so far. Arabella tries to cheer up her friend by basically advising Lady Pole to count her blessings, among them Sir Walter’s love, Lady Pole will have none of it and even turns it around on Arabella, asking what good Mr. Strange’s love ever did her. Jonathan Strange creates a road. At which point every even mildly astute viewer groaned a little inside. Because, obviously, we’ll see about that. I think my issue here is that sometimes a great line in a book only ends up being really obvious when it’s delivered with such deliberate nonchalance in a screen adaptation. I suppose it beats having to see the line delivered with melodramatic significance, but I think perhaps they went a little too far in the opposite direction from that here. 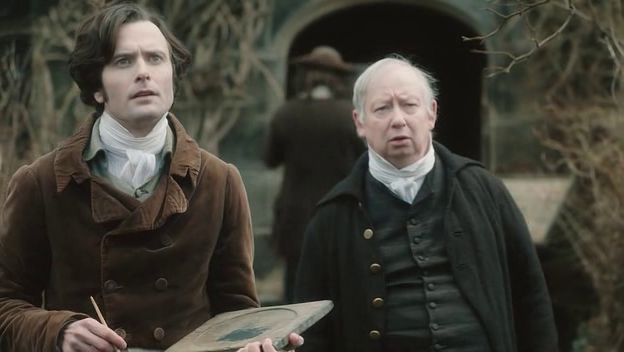 In England again, Childermass is having some misgivings about stealing all the Stranges’ mail and says so to Norrell. Norrell is characteristically evasive, but manages to assure Childermass that it’s for the best. Norrell then sends Childermass on an errand, which turns out to be breaking into the Poles’ house and stealing Lady Pole’s tapestry, which he does. 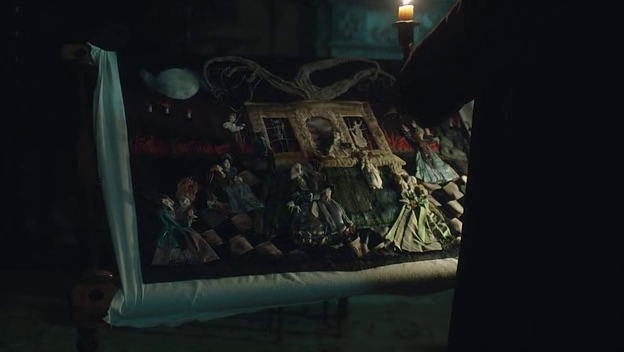 Robbed of her tapestry–effectively having her voice stolen–a distraught Lady Pole attempts to kill herself, only to learn from Mr. Norrell that she cannot die. Not for another seventy-odd years, anyway. This scene is, frankly, absolutely chilling: Lady Pole in her nightdress, strapped to a small bed in an empty room, with Norrell standing over her. Norrell giving her the bad news and then physically trying to silence her anger, frustration and despair. And, finally, Norrell going to Sir Walter, lying about Lady Pole’s condition and then advising Sir Walter to separate Lady Pole from Arabella. And this is all edited together with more of Strange’s escapades in the war, which on the one hand is perhaps a good thing–to break up these scenes so it’s not just one long sequence of Norrell’s terrible treatment of Lady Pole–but is made into something much less than comfortable when we see what Strange is up to, which isn’t much good. Indeed, Strange is being shaped into someone rather frightening himself. First, Wellington wants Strange to move an entire forest, which brings up an interesting conversation about how that might be done. Unfortunately, Wellington isn’t interested in Strange’s musings about talking to trees, because I would have loved to hear more about it. When Strange goes to move the forest, he and the men he’s with find themselves under attack. Strange can’t get the forest to move, and while Strange does manage to save the lives of most of the men, Strange’s servant, Jeremy, is hit by cannon fire and dies. Also lost are all of the books that Strange has brought with him to work from. This is a significant problem when it comes to Strange’s next task, which is to find out where some Neapolitan soldiers have taken a bunch of cannons they stole. Strange is without any books, the army has no live Neapolitans to question, and scrying in water just shows trees and grass that could be anywhere in the countryside. However, it turns out that they do have some Neapolitan corpses, which Strange brings to life and grants speech to, in an interesting counterpoint to Norrell’s silencing of Lady Pole. Unfortunately, Strange is no more successful than Norrell with this sort of magic. While Norrell only managed to give Lady Pole half a life, leaving her quite absent from the real world, Strange’s Neapolitans are all to real and persistently alive-ish. And rotting. And begging to be allowed to return to their families. It’s very shortly obvious that Jonathan Strange has done something pretty messed up here and doesn’t have any idea how to undo it. In another parallel to Mr. Norrell, Strange is also lauded as a sort of hero for what is pretty much exactly the sort of magic that he doesn’t want to do at all. This is not modern magic. However, Strange seems consoled as he rides away into a beautiful new dawn while the unlucky undead Neapolitans are burned behind him. It feels very telling to me how much alike Strange and Norrell seem when Strange finally returns to England. For all their differences in temperament, age, appearance, and experience, they seem very nearly equals now. Lady Pole comes for Mr. Norrell. 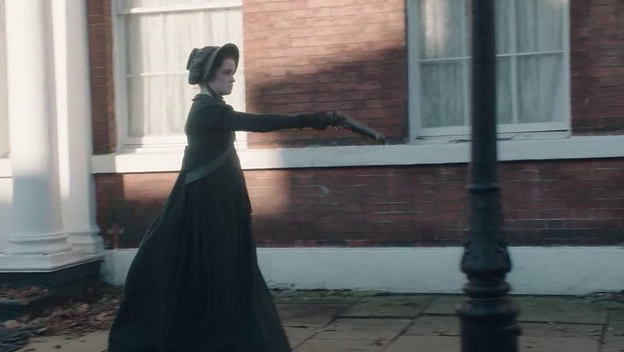 The episode ends, of course, with Lady Pole’s attempt on Mr. Norrell’s life, in which she misses her mark but succeeds only in shooting Childermass instead. It’s a great ending to a very busy episode that covered a lot of ground. I still think the show struggles with conveying the passage of time–it’s not at all clear that Jonathan Strange has been gone for some three years, for example–but the pacing of this episode felt just right and the interweaving of the various story lines was masterfully done. So far, the mini-series is faithful to the book without being a slave to it, and the changes that have been made are mostly smart ones that I think enhance the material rather than otherwise.